Do you ever have those days where they just seem hard? Maybe you're in a season in life where you're waiting on God to answer "yes" to your prayer. Or maybe just a hard season in general because of a specific trial. I've been there. Let's be real, we all have been there. When it seems like you're just trying to get by & get through your day. By the end of the day, you're mentally & physically exhausted. Some time last year, I started writing down something good that happened every day. A lot of days, it would feel like I was just trying to pull anything out of the air to write down-- But you know what? I still found something. Soon it turned into writing down something I was thankful for every day. 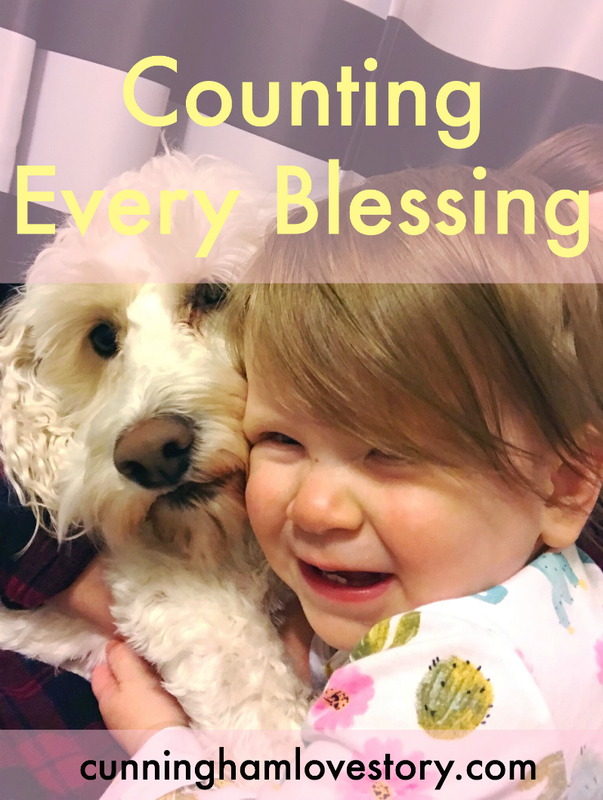 Did you know you can be thankful every day of the year, not just on Thanksgiving?! God has been so gracious in revealing things to be thankful for each day. Some days it may be that I'm thankful for Walmart grocery pickup because Ruby is sick. Or it may be that I'm thankful for Andrew being so selfless that he got up early to clean some dishes in the sink. And other days it may be something that the Lord is teaching me by going through a trial & learning how to better trust in Him. When I started to shift my thinking from, "I'm just trying to get through today" to "Lord, thank YOU for this day" I started seeing God's work in the mundane-- every diaper I change, every sock I fold, every piece of food I pick up off the floor-- it's all Kingdom work. God is blessing me not just in the "big things" that the world might think of, but He's blessing me in simple things too. Colossians 3:17 says, "And whatever you do, in word or deed, do everything in the name of the Lord Jesus Christ, giving thanks to God the Father through Him." So whatever you're doing today, what do you have to thank God for? Shifting our minds to start seeing the good in our days, even our hardest days, will cause us to praise Him more & ultimately, glorify Him. There is ALWAYS something to be thankful for. I mean if you're reading this, that is something right there that God has blessed you with-- the ability to see, read & be alive! I would encourage you to write down your blessings each day. It's amazing how God will use it to show you how easily you get tripped up about trivial things, & how you should be focusing on the bigger picture... Glorifying Him & spreading the Gospel of His love & redemption! I came across this song recently & hope some of the words encourage you like they have me! Even when you're going through something that you can't even imagine how you'll ever get past, God is still good! He is still SO good. Surely every season You are good to me.